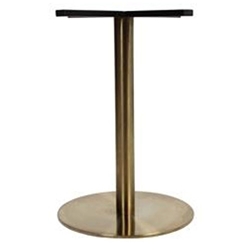 Features: Indoor use Table base. Tops: 450mm base is Suitable for tops up to 800mm square and the 540mm round bases for tops up to 1000mm round. Frame: 202 Stainless Steel Electro plated in a Brushed Brass finish. Also available in Brushed Copper Finish. Matching Dry Bar also available.